We've had loads of fun with Need For Speed Rivals and feel that we've not even touched the surface of the driving challenges available. There are two types of racing games in this world: the ones that have painstakingly captured every minuscule piece of information surrounding the cars, the tracks, and the world we live in; and those that are there just to have a bit of fun. 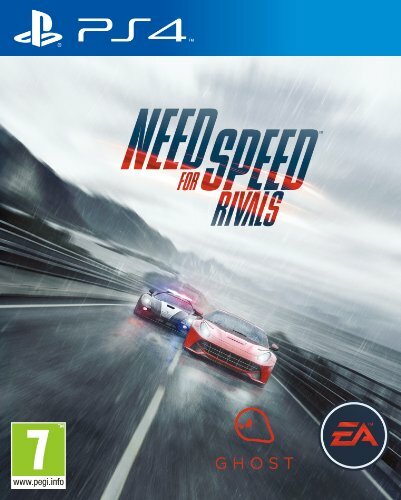 Need For Speed Rivals clearly falls into the second camp, but does that mean you will tire of it too quickly, or has EA created a game that tops its predecessors and will see you coming back for more? Rivals doesn't really have a storyline, but then this is a driving game so we can't say we care too much. The game gives you two play options: take the wheel as a racer to tear up the free play world that you exist in, or play as cops trying to keep the peace. There are no boring cutscenes that try to help you justify anything, and certainly no backstory about how you are only racing to save your family being held by some Ray Liotta looking character. It's all about the fun. That doesn't mean to say that there isn't a campaign to complete, but you'll not only be hard pushed to care, but also to remember you've got to complete certain tasks to progress in the first place. Set in the make-believe world of Red View County, Rivals' vast map is completely open and waiting to be explored. There is a range of different areas but with a huge focus on the countryside rather than city racing. For the most part it feels like racing at the foot of Lake Tahoe, with some coastal stuff thrown in for good measure. There are deserts, farming land, some Beverly-Hills-esque housing, and snow capped mountains too. The range of terrain certainly delivers in terms of different racing and driving opportunities - not that you'll have much time to see what's going on as you hurtle break-neck speed through it with the vistas whizzing by in a blur. Gameplay wise Rivals feels like a mixture of Need For Speed: Hot Pursuit, Most Wanted and Burnout: Paradise if we had to pick comparative titles. We've been playing Need For Speed: Rivals on the PlayStation 4 and graphics are stunning, complete with huge vistas and close-up detail that gives you plenty to look at as you drive around. Not a PS4 player? You can also get Rivals on the PS3, Xbox 360 and Xbone One. Ghost, the game's developer, has used the Frostbite 3 engine - the same as adapted for Battlefield 4 - and it's a definite hit. Dynamic lighting, rain, nightfall, sunsets, lens flare, dust, snow, and falling leaves all help breathe life into the gameplay, giving you a greater sense of realism than ever before. Damage your car and at times the handling reacts accordingly, including driving on burst tyres. Crashes, you'll have plenty of them, are epic, although it's disappointing from a realism point of view that your car doesn't end up a complete wreck when you get back on track. As for car physics there isn't much difference between the range of cars from Porsche to Mercs to Aston Martins aside from things getting faster and faster. Forza this isn't. Interacting with the surrounding environment can be a bit hit or miss though. Drive along a dirt track and the PS4 DualShock 4 controller slightly rumbles so you know you aren't on the smooth tarmac, but smash through a farmer's barn and you'll feel nothing. As you can probably tell there are a lot of chances to get distracted in Need For Speed: Rivals. Like in Burnout, the premise is to drive to different locations around the world to complete specific missions, races, takedowns or escapes depending on which faction - racer or cop - that you've opted to play. The cop strain of the game is all about keeping the peace by taking down racers and knocking them off the road. To do so you are given a bevy of Pursuit Tech which you can buy after earning experience credits by driving fast, dangerously, or by taking out racers - you effectively steal their experience points. Do so and you'll get more cars, and more takedown tech. That tech includes simple things like spikes to more pie-in-the-sky tech like an EMP gun that cuts the fugitive's engine so you can ram them. Rather than having a dedicated single-player and multiplayer-element the game is focused around something called "AllDrive". The idea is that you can dip in and out of races whenever you fancy racing against the community or spend hours just driving around staying out of trouble. It's like an always-on multiplayer, even if you're intent on going about your solo business. Cops get the added bonus of working as a team in a chase, and just like Battlefield that rewards you for being part of a squad that follows orders. If you are part of the police squad that takes down a criminal, you'll all get the points the driver had rather than having to divvy them up as if you were in a lottery syndicate. On the flip side as a racer it's all about evading the police and the constant dilemma of staying out racing longer to earn more points quickly or banking what you've got at various hideouts around the world and getting better cars because of it. Get busted and you lose everything. It's a bit like The Weakest Link and is one of the main drivers of the game. Pun intended. You can prepare your next gaming session in advance too. EasyDrive is a shortcut to access your progress, where you can create Autolog Playlists with the help of Need for Speed Network. In this vast world you can have up to 12 players in play at any one time. It's a shame it's not 10 times more than that for a wilder experience. Players can come and go rather than you setting up a dedicated task or mission. That's fine, but you'll soon struggle to find them especially if you don't all start in the same area of the map. It all feels a bit spread out which brings with it a feeling of emptiness at times. The Need for Speed Network is the game's second-screen experience that is run via a browser and an Origin account. When you are playing on the PS4 it detects the console and switches into "Navigator Mode", allowing you to see your position in real time and set waypoints to events and collectibles. It looks a bit like the Grand Theft Auto V map, really. When you aren't playing you can use it on your computer or tablet to find detailed information you've gained so far. Track your game progression as a cop or a racer by viewing your SpeedList/Assignments and current objectives, and compare and compete with your Need for Speed friends to be the top Rival. You can also do something called OverWatch, a feature that lets you see your friends playing in real-time, and interact with them on the move - by helping them out, while simultaneously unlocking some exclusive content. Need For Speed Rivals won't be for everyone, the lack of focus is perhaps its greatest and weakest strengths. It's almost as if there's too much possibility in this vast world, and it needed to be carved into something more distinct. There's greatness bursting to get out, but it's just not as tidy as it could have been in its current form. In the hours we've been playing Rivals we've already felt that we've lost focus too many times. In some respects that makes it a game that's great to dip into after an evening down the pub. But for gamers who like to have that greater sense of completion and focus, you won't get it here. What Rivals delivers is a fun ride with the added bonus of taking down bad guys or evading the cops depending on what your slant is. Get bored with one and you can easily switch between cop and racer, so there's added variety. We've had loads of fun with Need For Speed: Rivals and given its scope feel that we've only scratched the surface of all the driving challenges available. At the same time the sheer scale makes the game feel as though it's less focused than it could have been, which is its ultimate shortcoming. Rivals isn't the greatest of racing simulators for those who want a track experience. But that's okay, we're fine with that. Driving is fast and frenetic, even if it's not true to life, but that's what makes it fun and worthy of being in your opening PS4 games collection.